Vietnamese mint is easy to grow and the leaves are used in salads and other recipes such as Goi Ga which is a traditional chicken and cabbage salad. It is also known as ‘Hot Mint’ due to the spicy or ‘peppery’ flavour of the leaves. The leaves are usual used fresh, although they could be dried if required. 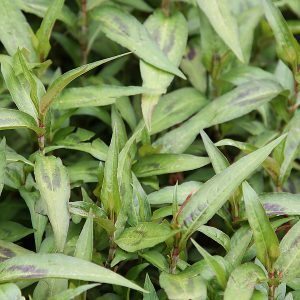 The botanical name is Persicaria odorata and it is also known as Vietnamese coriander. This is a plant that spreads easily, so is best grown in a container or a restricted area in the garden. The foliage is a mid green with a purple marking on each leave. Low growing and spreading by underground roots it is a vigorous plant in good conditions. Used extensively in soups and salads, both for the taste as well as its medicinal benefits where it is said to aid digestion, hot mint is said to have there benefits. You will need a frost free position as this is a tender herb. Choose a humus rich soil with aded cow manure. A position in light shade is best. Moisture through summer is essential for good growth. Simply plant the seedling and water in well, maintain good moisture over the establishment period. Water with a liquid seaweed fertiliser every two weeks.